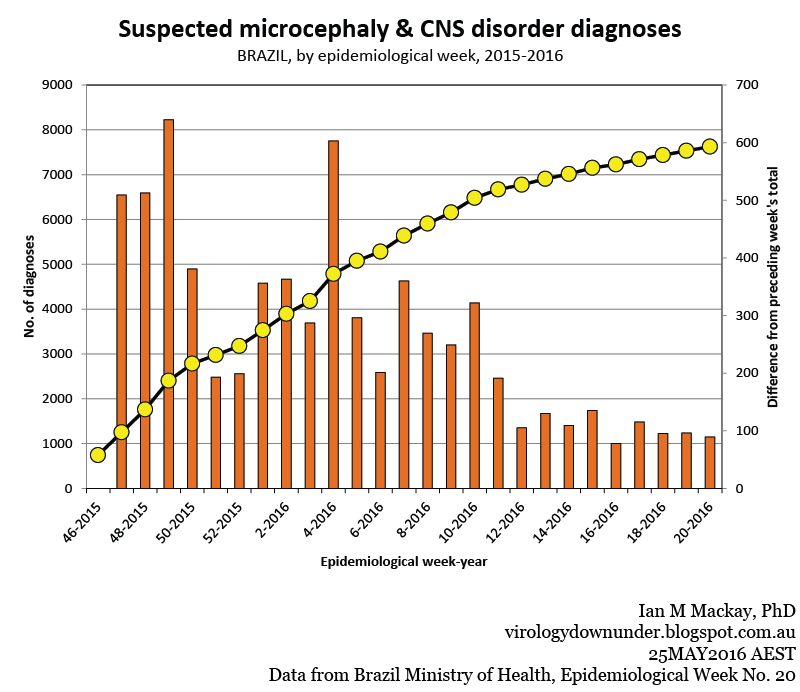 These graphs are made by me using data obtained from epidemiological week (EW) number 20's Brazil Ministry of Health microcephaly and foetal and infant microcephaly and central nervous system (CNS) disorders (M&CD) report. Brazil last reported a total of 120,161 suspected Zika virus detections some weeks back. Around one thousand of these have been portability confirmed. The total number of suspected M&CD cases increased by 89 to 7,623 this EW (compared to last). The graph above shows the number of suspected M&CD diagnoses in Brazil up to 21-May-2016. The cumulative curve (yellow dots; left hand axis) is growing, but slowly. This was another slower weekly rise (orange bars; right-hand axis). These bars are based on the difference in total suspected cases reported this EW compared to that reported in the last EW. 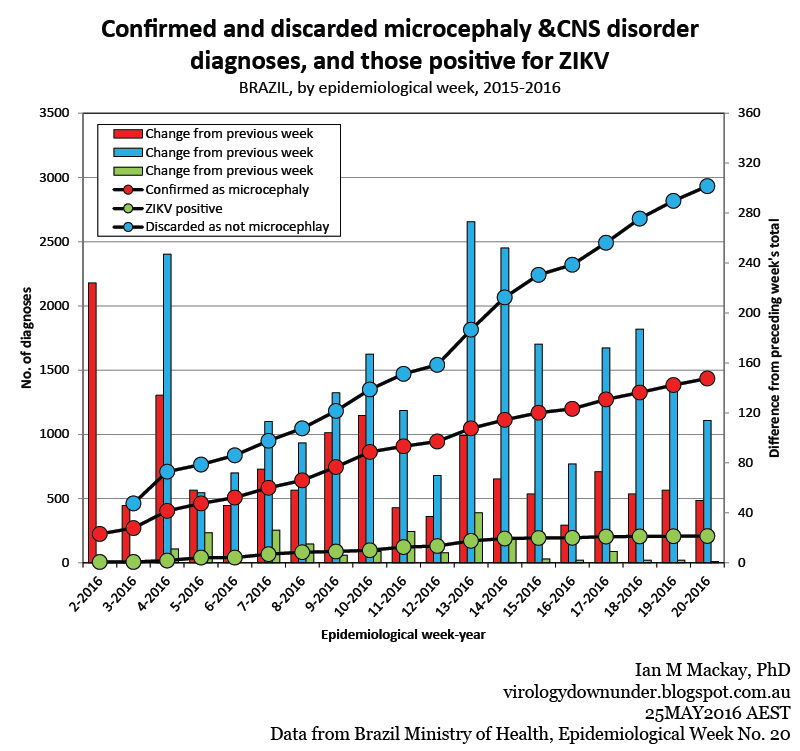 This method may not reflect the diagnoses that occurred during the past EW (some may have come from days or weeks earlier), but that level of detail is not available in the MOH report. M&CD cases under investigation decreased by 75 to 3,257 this week - the ninth consecutive decrease. In the graph above, we can see that 114 (blue bars; right hand axis) suspected M&CD diagnoses were discarded upon closer investigation with a current total of 2,932 removed. The rate of these resolved diagnoses (line with blue dots, left-hand axis) continues to outpace the rate of the smaller overall number of confirmed M&CD diagnoses (red dots, left-hand axis). As of this EW, 19% of suspected M&CD diagnoses have been confirmed while 38% of suspected diagnoses have been discarded-a percentage that has increased for 16 weeks. The cumulative number of confirmed M&CD diagnoses does continue its climb this EW, growing by 50 new diagnoses (red bars; right-hand axis) to total 1,434. 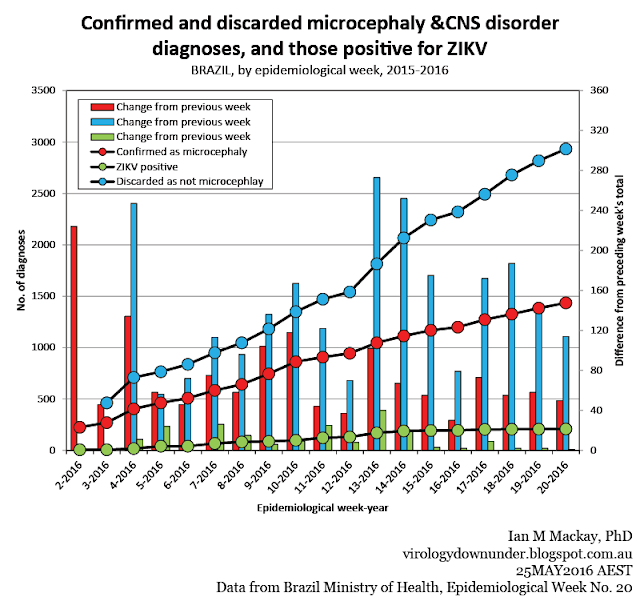 The number of these M&CD diagnoses to be confirmed with a Zika virus infection also grows (green dots; left-hand axis) by 1 new detection (green bars; right-hand axis) to 208 this EW. 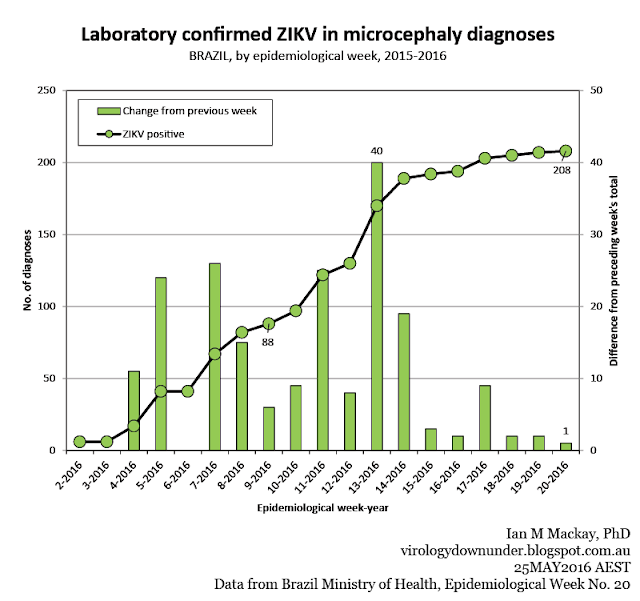 Those confirmed Zika virus infections represent 15% of all confirmed M&CD diagnoses and 3% of all suspect diagnoses.